For my grandfather’s 80th birthday, my sisters and I combined our talents in the kitchen to gift him with a membership to our very own Sweet Treats of the Month club. Each month during his 80th year of life, we presented him with various platters and tins of homemade cookies, candies, bars, muffins, and cakes. As my grandmother anxiously watched his waistline and blood pressure, my grandfather eagerly waited by the mailbox for his monthly deliveries. It worked out to be the perfect gift for a man who has just about everything he desires in life. Turns out that my grandfather wasn’t the only one who thought a membership in the Sweet Treats of the Month club was a grand gift. As the holidays approached, my father made a not-so-subtle Christmas wish to be enrolled in that homemade goodies club. You can imagine his delight when Christmas brought him his first installment of goodies along with the notification of his enrollment in this very exclusive club. This weekend, we’ll be traveling to see my parents and other family who we’ve yet to celebrate the holidays with. We’ll also be hand delivering my dad’s January installment of treats. The beautiful thing about this exclusive club is that it’s 100% customizable to the member’s tastes. This means that my dad’s year of treats will be heavily focused on dark chocolates, gingery goodies, oatmeal creations, and maybe even a few chocolate-drizzled macaroons. So, I set out in search of the perfect recipe for the January installment of goodies. Then, as if in answer to my mission, a fellow food blogger, at Liv Life, recently posted a list of her top ten recipes for the year. 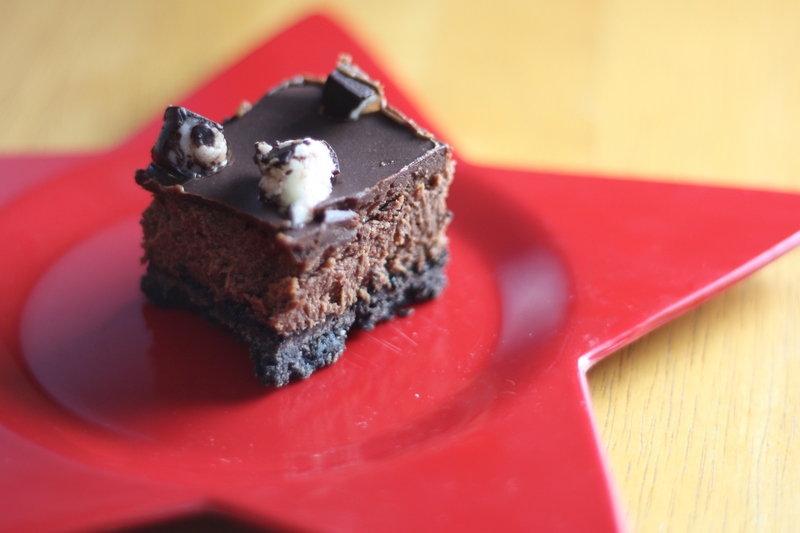 Included in the list was a recipe for Chocolate Peppermint Cheesecake Bars. They looked absolutely luscious and right up my dad’s alley. Her post led me to the original Food Network recipe for Chocolate Cheesecake Candy Cane Bars. After a few little modifications, aimed at running the minty flavor throughout the bars, and a substitution of peppermint patties for candy canes, I came up with these; Peppermint Patty Cheesecake Bars. Pretty sure my dad will be pleased! Preheat oven to 350 degrees. Line an 8×8 baking dish with foil. Combine crushed cookies with melted butter. Press the cookie mixture into the bottom of the baking dish. Bake for about 15 minutes. Meanwhile, prepare the filling. Using an electric mixer, beat together the cream cheese, sour cream and sugar until smooth. Add the eggs and beat for another minute or two. Melt the chocolate slowly in the microwave or in a bowl set over a pot of boiling water, stirring frequently. Add the melted chocolate and the peppermint extract to the cream cheese mixture and mix until combined. Pour the filling over the prepared crust. Bake for 25-30 minutes until slightly puffed around the edges. The center will appear slightly loose. Remove from oven and allow to cool for about 30 minutes. To make the glaze, place bittersweet chocolate, butter, and corn syrup in a microwave-safe bowl. Heat for about 30 seconds at a time, stirring periodically, until completely melted. Stir in the sour cream. Spread the glaze over the cheesecake. 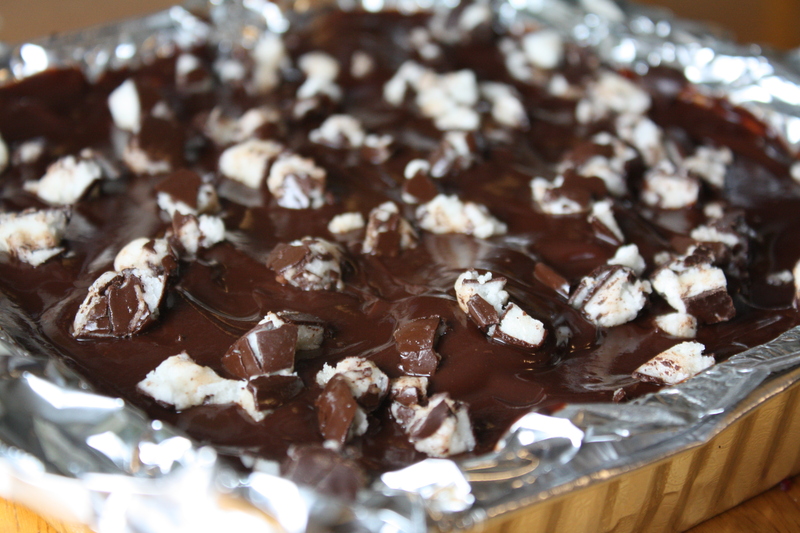 Sprinkle with pieces of the peppermint patty candies. Refrigerate overnight to thoroughly chill. Use the foil to lift the cheesecake from the baking dish and cut into small squares or bars. Posted in Baking, Cakes, Chocolate, Desserts, Food, Recipes and tagged baking, cake, candy, cheesecake, chocolate, Cooking, dad, dessert, family, Food, Recipes. Bookmark the permalink. YUM! I love that the filling is chocolate cheesecake! What a fun idea and so creative. And oh my goodness do those cheesecake bars look incredible. I would seriously have a hard time not eating every single one. YUM!!! 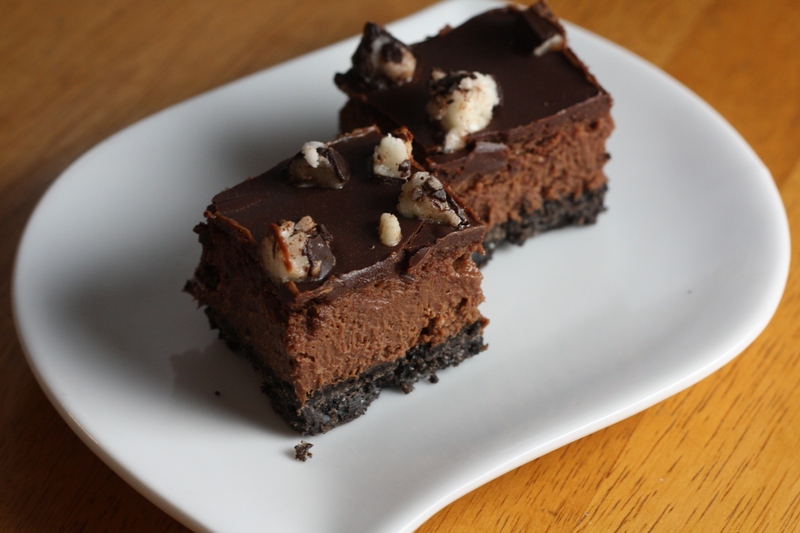 Love your chocolate cheesecake bars, would be so hard to stay away from them. Beautiful…that chocolate filling is calling my name!!! I love the homemade treat club!! What a neat idea. Love these treats too! We used Trader Joe’s Candy Cane Joe Joe’s for something similar this season. I buy a few extra to use over the year as they sell out. Glorious! I must make these I believe. 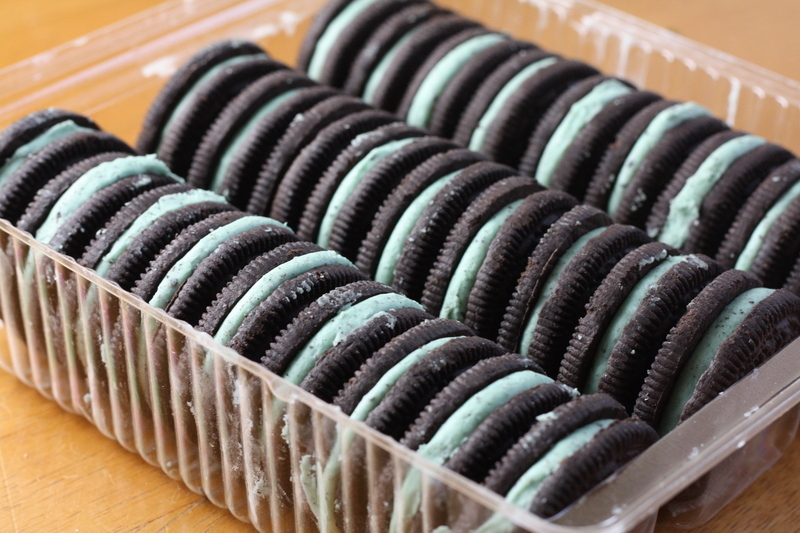 So much wonderful minty goodness.